Stores reference 6D/473. 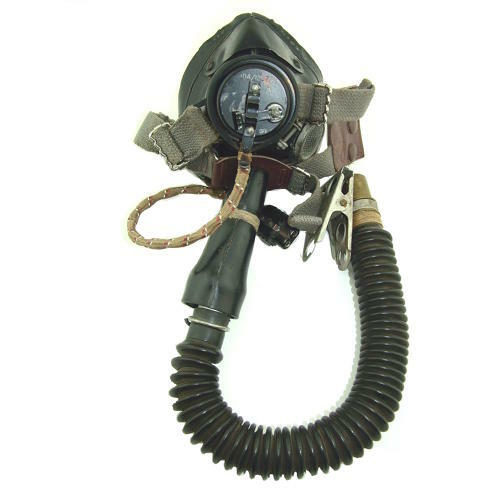 This is the later pattern variant of the E-mask complete with anti-suffocation/inspiratory valve and an elasticated webbing harness in place of the earlier leather types. The rubber is in very good condition with only minor signs of crazing. The mask edges are 95% complete, the overall shape is excellent and the rubber remains very pliable. Air Ministry contract markings are evident on the facepiece moulding. The chamois inner edging is complete and reasonably clean. The conical tube at the base of the facepiece remains in place and is also in excellent condition, complete with alloy pipe/valve within. The webbing harness is complete and retains reasonable colour and a little elasticity. The three press studs all have their original finish. Fitted with a type 48 microphone assembly (type 26 mic 10A/12570 and short loom/plug) and anti-freeze inner gauze plate - all in excellent condition. Also fitted with the correct early pattern oxygen tube with MK.IV brass bayonet connector/cadmium plated crocodile clothing clip. This too is good and pliable with relatively minor cracking within the folds of the corrugation. Please note that this mask is guaranteed to be 100% original and should not be confused with the 'hybrid' masks that have been offered elsewhere in recent years. Those have original metalwork and harnesses but brand new/reproduction rubber facepieces and linings. They are often fitted with incorrect later broader oxygen hoses too. A very good '+' used example of this type of mask. Stock code O22254.